Located on the Merrimack River, the Downtown Newburyport Cultural District is a charming, old-fashioned historical area offering an eclectic blend of arts, entertainment, dining, shopping, and cultural experiences. Newburyport affords residents and visitors alike a taste of history with its Colonial-era architecture, as well as its contemporary art, along the boardwalk. Widely known as the birthplace of the U.S. Coast Guard, Newburyport is rich in maritime history, as anyone who has taken a walking tour along the Clipper Heritage Trail will tell you. Craving more historical fare? 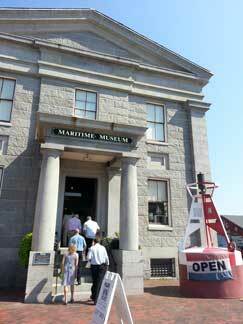 Stop by the Custom House Maritime Museum to learn about Newburyport’s ship-building past. Want to satisfy your thirst for local art? Mosey on down the street to the Newburyport Art Association where there are more than a few artists offering and showcasing their finest work. Want something totally different altogether? The Tannery Marketplace is the perfect locale for many unique and independently-owned gift stores, bakeries, bookstores, and The Actors Studio, a small, cozy theater. A testament to the well-planned urban landscape in Newburyport, visitors can easily follow the district along Liberty Street with its many shops to State Street, the heart of the district. There awaits the fine dining, art galleries, and shopping that individuals from all over New England have come to know and love.